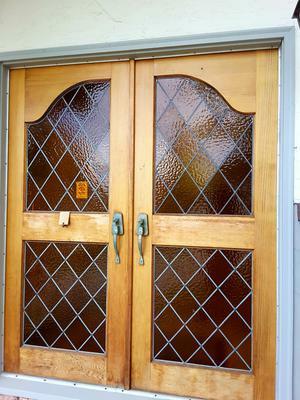 Hi, We would like to change the look of our entrance door. 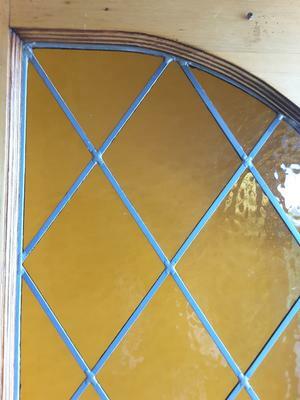 The stained glass colour is some kind of brownish orange. I was wondering to what colours the stained glass can be changed? We are open what colour the door should be painted, it really depends on the colour we end up on the stained glass. Looking forward to hear from you. Thank you ! The amber colored glass will greatly affect the transparent color you put on top. Most likely the results would end up looking quite dull. A transparent blue on top of the amber will result in some sort of green. A transparent red will turn a shade of orange, and so on. The other challenge is that the glass would need to be baked in your home oven to make it resistant to wear and cleaning. Sorry I couldn't bring you a solution.